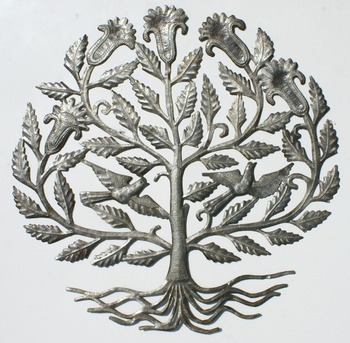 Metal tree of life with flowers and flying birds, not painted handmade design of natural metal color, handcrafted in Croix des Bouquets, village in Haiti, made of recycled steel oil drums. Round. Size 60cm (24"). Retail and wholesale, shipping worldwide. Place the order by sending me message. We at C2A Enterprise are selling a wide variety of handmade crafts, jewelry and other products. We are also selling handmade ethnic products from different countries.